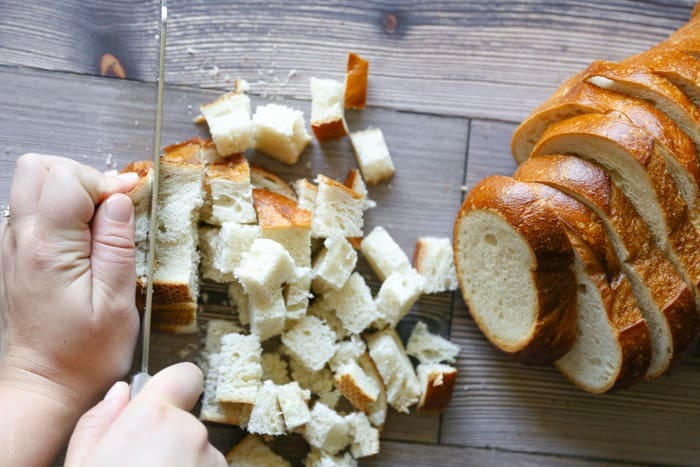 If you’ve ever wondered how to make homemade croutons, you’ve come to the right place. These healthier croutons only require 4 ingredients and come together in a snap. When I buy my Boudin sourdough bread at Costco it comes in a pack of two. 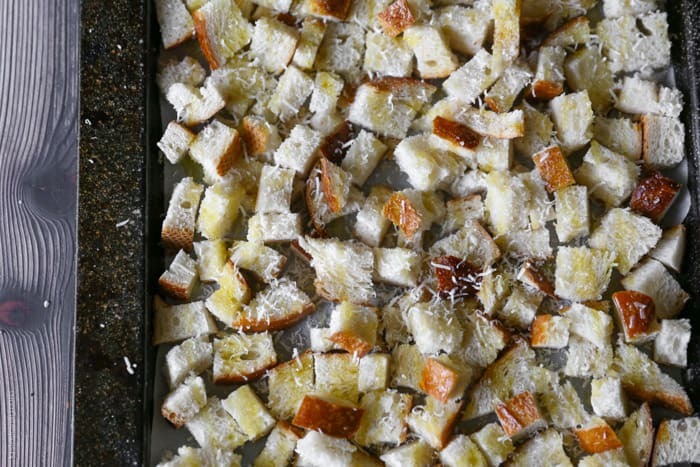 These sourdough croutons are the perfect use for the second loaf of bread. Feel free to use any bread you have on hand, and to mix up the seasoning too. The flavor possibilities are endless. I like to make these in a big batch, then store the them in a ziploc bag so I have them on hand to easily toss in to salads or use to garnish soups. 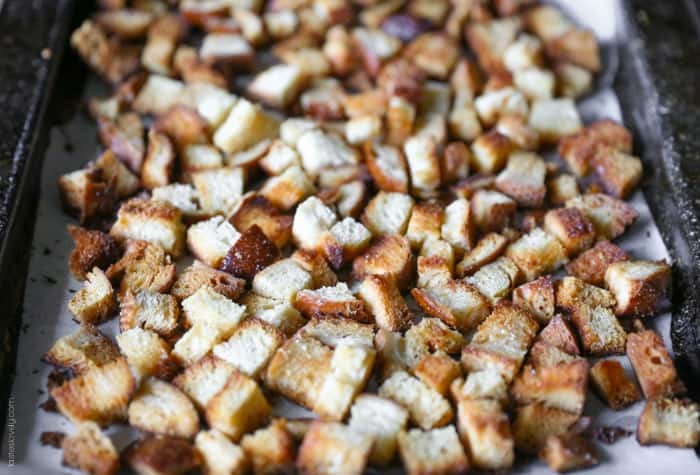 But you can easily scale this recipe down if you need a smaller serving of croutons. You need bread, olive oil, garlic salt and Parmesan cheese. Start by stacking up a few pieces of bread. 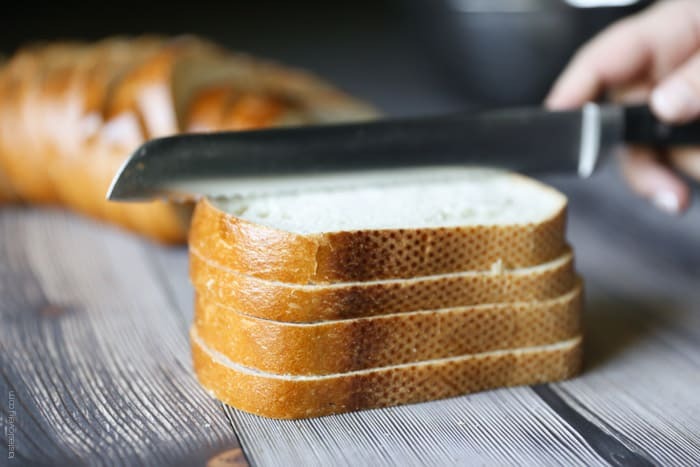 Slice the bread length ways into thirds. It’s ok to leave the crust on. I’m a crust lover. If you’re not, go ahead and cut them off. You want the cuts to be about 3/4″ squares. Try and keep them equal in size so they cook evenly. Now is the really easy part. 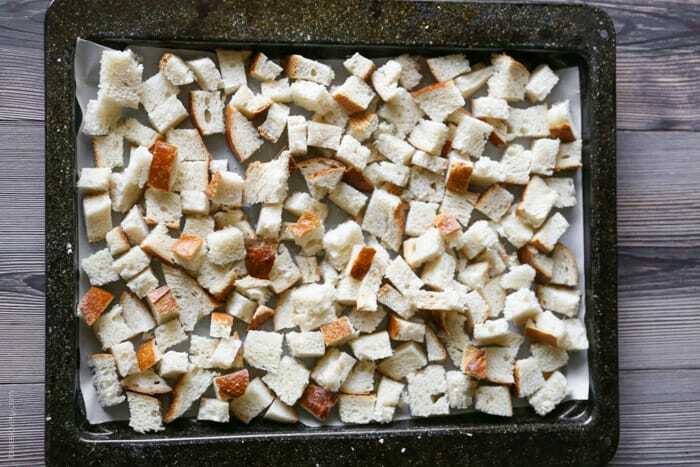 Spread the croutons in an even layer on parchment lined baking sheets. 1 loaf of bread will fill up 3 baking sheets. 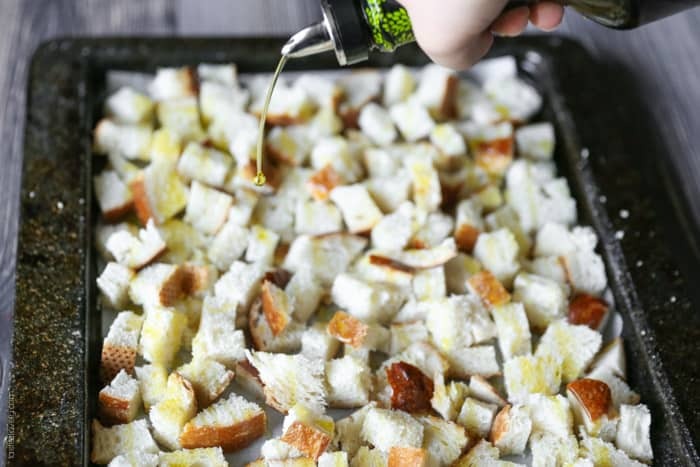 Drizzle the croutons with olive oil. No need to toss them to coat, the olive oil will drip through to the other side. Sprinkle on the garlic salt. I’ve tried this before with fresh garlic, but it was a tad too strong. Stick with the garlic salt. 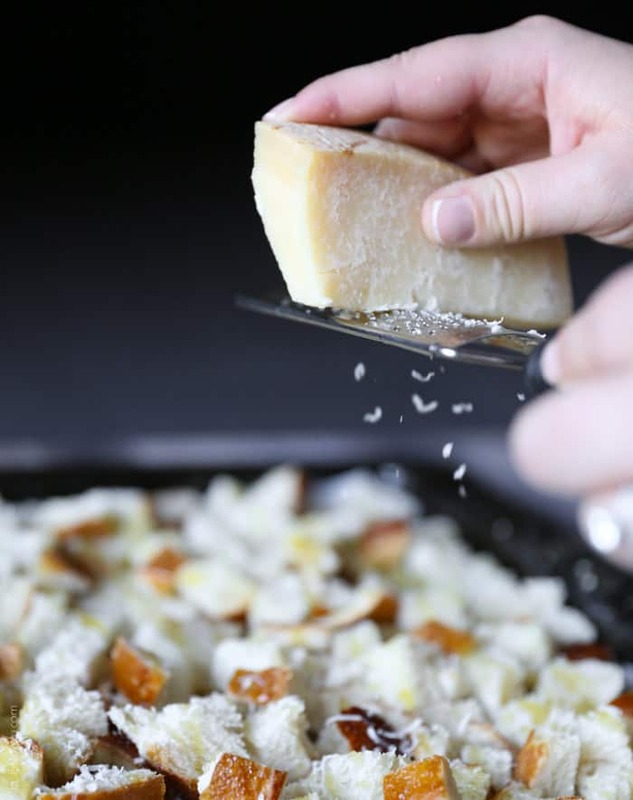 Last, grate on a light layer of Parmesan cheese. Now they’re all ready to toast up in the oven. Cook at 300 degrees for about 30 minutes, tossing 2-3 times and rotating baking sheets if necessary. Cook until golden brown and crispy. Before. Just hunks of bread. After. 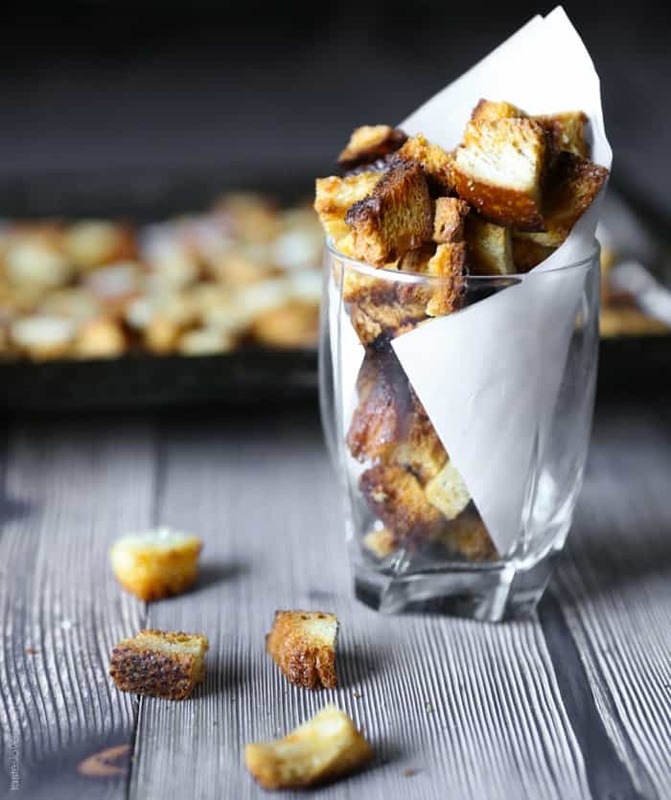 Now transformed in to crispy & tasty croutons. These taste so much better homemade. 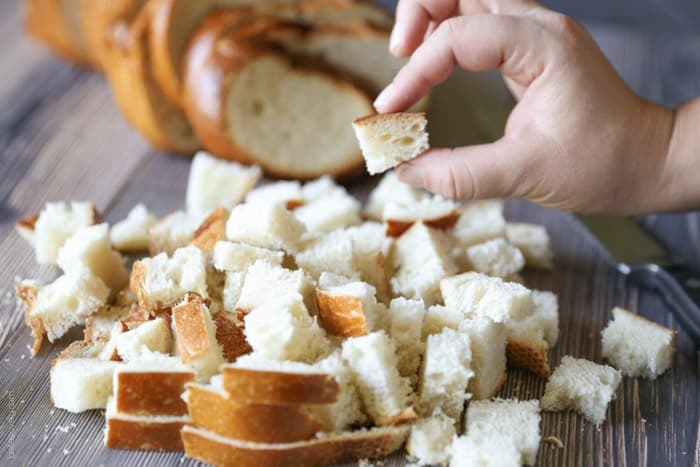 Now you never need to buy croutons again. 1. 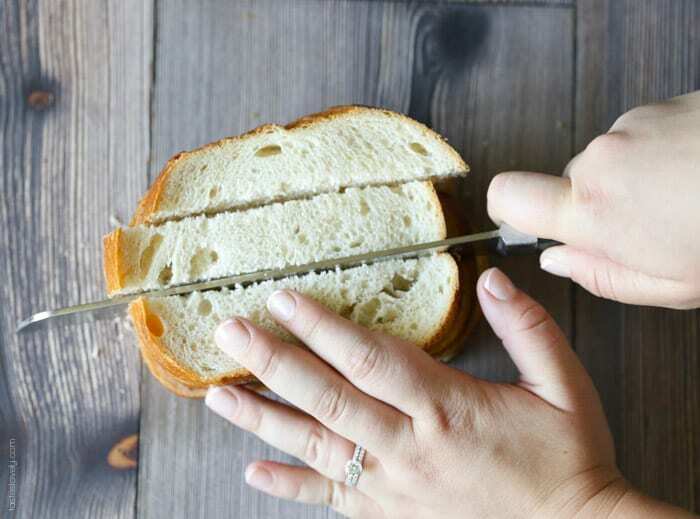 Cut the bread in to 3/4 inch pieces. 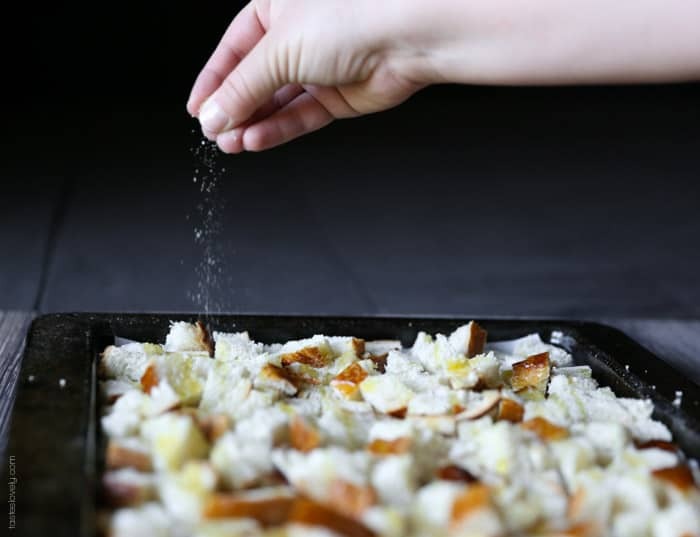 Spread an even layer of croutons on parchment lined baking sheet. 1 loaf of bread will fill 3 baking sheets. 2. 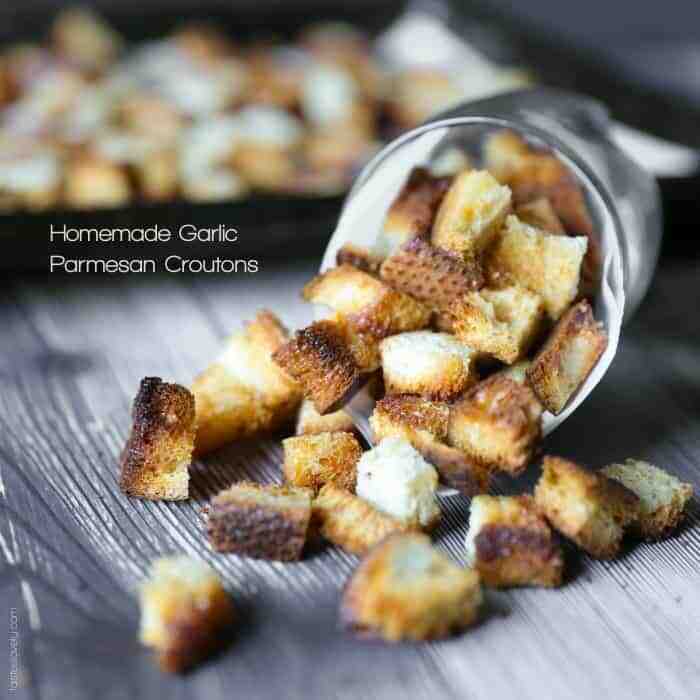 For each baking sheet full of croutons drizzle on 2 tbs olive oil, 1 tbs garlic salt and 1 tbs grated parmesan. No need to toss to combine. 3. Cook in 300 degree oven for about 30 minutes, tossing the croutons every 10 minutes and rotating cookie sheets if necessary. Cook until golden brown and crispy. Store in a ziploc bag. Will keep for 3 months. Use in salads or to top soups. 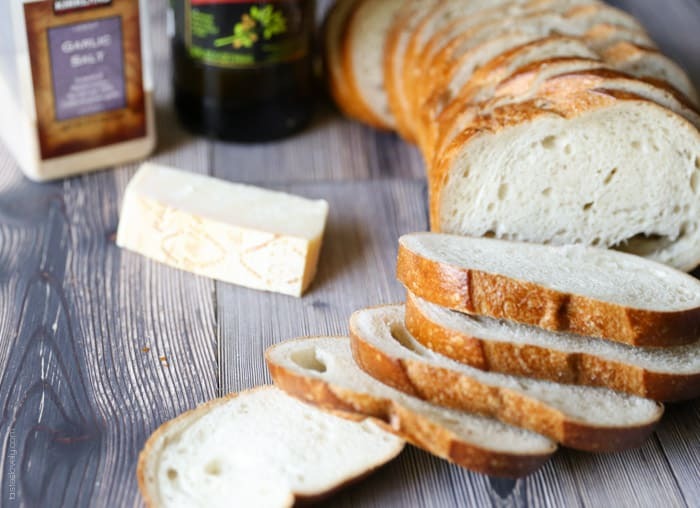 Feel free to use any bread you have on hand such as italian or whole wheat. 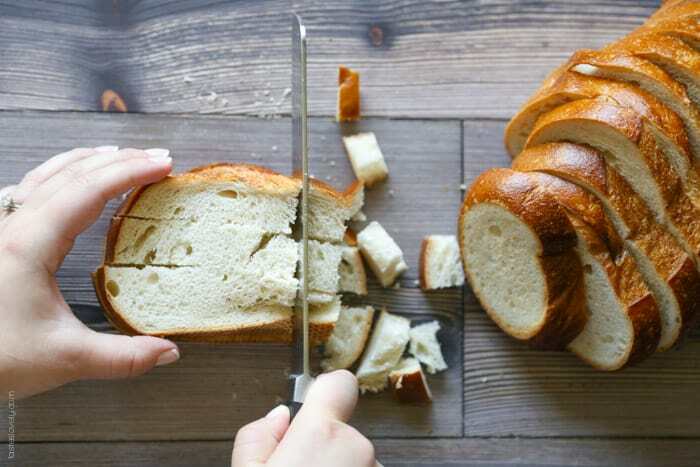 If you don’t want to make a whole loaf, recipe can easily be scaled down to make smaller servings. yum!!! Never made homemade croutons before, but your recipe is so easy that there is no reason why I should not make them!! these look so good I want to crunch on some as a snack now!!!!! Italian bread works great too! I’ve even made this with whole wheat bread or crusty french loaf bread, just whatever I have on hand. I hope you love it!